A lot of people are bitching about the sheer snottiness of this passage in a Vox piece arguing that fighting for $15 minimum wage will lead, instead, to the automation of those minimum wage jobs. The McDonald’s experiment with touchscreen ordering systems illustrates the potential problem with making high minimum wages effective across big states like California and New York — both of which passed minimum wage increases this year. If McDonald’s automates its locations in Manhattan, San Francisco, and Silicon Valley, displaced workers shouldn’t have too much trouble finding alternative work in the booming economies of these cities as barbers, servers at full-service restaurants, nannies, and so forth. With lots of wealthy customers around, there’s a robust demand for unskilled service workers there. But the outlook might not be so rosy in cities like Fresno, California, or Rochester, New York, where the economy is not booming and average wages are much lower. If a $15 minimum wage causes fast-food jobs to be automated in these cities, workers may not be able to find alternate work. A law designed to put more money in workers’ pockets could wind up putting a lot less money in their pockets instead. The Fight for 15 has more to do with what is a living wage than poetic devices. Indeed, even $15 actually doesn’t pay enough to rent an apartment, even in the hinterlands. But I’m just as disgusted by the suggestion that if people live in booming economies, they can get jobs making $15 an hour as a barber or a restaurant server. 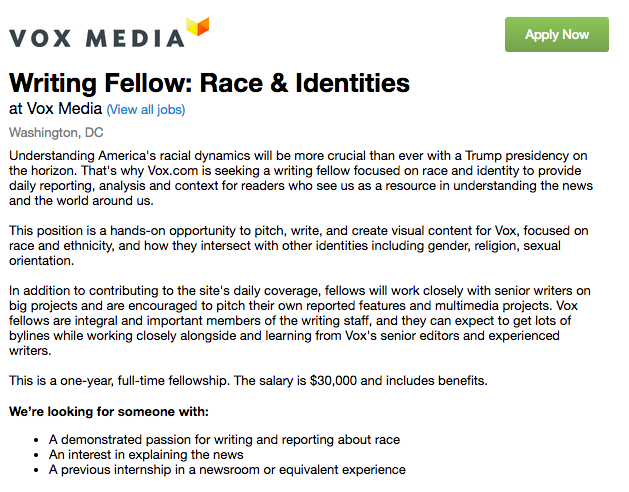 They also could, with some prior experience, apply to be Vox’s “race and identities” writing fellow for … $15 an hour. And that’s to live in NYC or DC, cities where $15 an hour is well below a living wage. Maybe Vox just plans on automating their race coverage if no one will take this job? Update: Vox’s Managing Editor just announced on Twitter they will be increasing the rate for this and other fellowships. Good!